Typographically speaking, a leader is a sequence of typeset characters that leads from here to there—generally from one side of the page to the other—as in a menu or a table of contents. A leader consisting of a series of periods is so commonplace that you might think this is your only option…and a boring one at that. Far from it; in fact, any leader you can create in InDesign or Illustrator can be decorated with whatever typeset characters you want. Whenever you set a tab in InDesign or Illustrator, you can choose to fill the void between the preceding text and the tabbed text with a leader. To do this, open the Tabs panel, select one of the tab stops on the ruler, and just type any sequence of up to eight characters in the Leader field in the Tabs panel. (You can find the Tabs panel either under the Type menu or by pressing Shift-Command-T [PC: Shift-Ctrl-T].) Eight may seem like a lot but among other options, this allows you to alter the spacing between leader characters by adding spaces between them. The possibilities for leader patterns are endless. Remember that everyday characters and symbols can become quite abstract when used in series. The samples shown here start with a simple series of Snell Roundhand lower case s’s, range through oddities from the Wingdings and Symbol fonts, and end with commonplace double-daggers and guillemets (a.k.a. angle quotes) from Times Roman. Tightening tracking to create a continuous ligature can often disguise familiar symbols. To change the formatting of the tab leader, select it in the document (not the Tabs panel) and then use either the Character panel or the Type menu. You can also use your Glyphs panel (Type>Glyphs) to help you locate characters and symbols you would like to use. Just double-click a character in the Glyphs panel to place it in your document, and then copy and paste it into the Leader field of your Tabs panel. From a decorative leader, it’s just a short jump to decorated lines in general. The Stroke panels in InDesign and Illustrator offer a variety of options for setting what in “typographese” are called rules. Dotted, dashed, wavy, multiple (or Scotch) rules, they’re all there. And they’re all pretty dull. To create rules with more pep, don’t use the Stroke panel—use Type on a Path instead and build your rules using characters from your fonts. Or you can even use both the Stroke panel and Type on a Path together. This is just how our sample menu was to make. We set the border of the text frame around the menu with a triple 6-point rule using the Stroke panel. Then, after selecting the frame, a second border treatment was added by setting a parade of characters on it using the Type on a Path tool (which is nested under the regular Type tool in the Toolbox). Just click on the stroke with the Type on a Path tool and either type your characters or use the Glyphs panel to add them. The characters in question are lighthouses from Adobe’s Carta font of map symbols. To get them to sit tidily on the center rule, open the Type on a Path>Options dialog from the Type menu. In the dialog, select Baseline in the Align pop-up menu and Center in the To Path pop-up menu. You can alter the spacing of such characters using the Tracking controls in the Control panel or Character panel. If you have a hard time getting the first character in the series aligned properly, set a word space before it and kern that first character backwards over the space to move it beyond its natural starting point (just place your cursor in between the space and the first character). Creating the little creeping snail leaders was trickier. 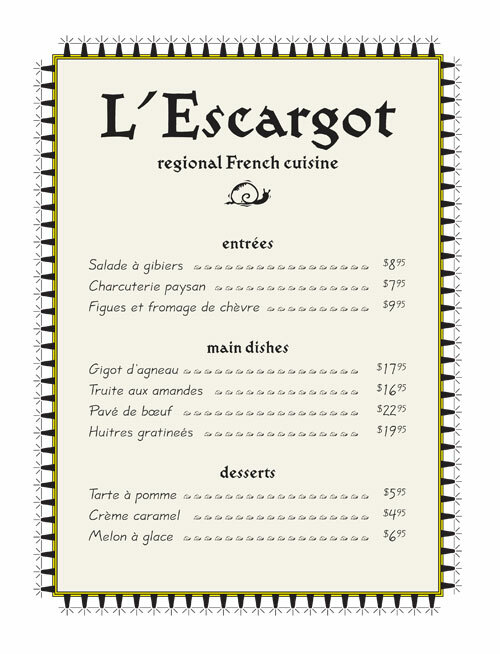 Because I had no mollusk fonts on hand, I used Macromedia Fontographer (any font editor would do) to add a piece of EPS clip art to one of my fonts, and voilà, Shift-S became a snail, or in this case, l’escargot. Type on a Path and a triple frame stroke create an unusual border in this menu. The marching snail tab leader comes from a font customized using a font editor.